For other people named Paul Walker, see Paul Walker (disambiguation). Walker began his career guest-starring on TV shows such as The Young and the Restless and Touched by an Angel. He later starred in films such as Joy Ride (2001), Timeline (2003), Into the Blue (2005), Eight Below (2006), and Running Scared (2006). He also appeared in the National Geographic series Expedition Great White (2010) and in ads for Davidoff Cool Water cologne. He founded the disaster-relief charity Reach Out Worldwide (ROWW) in response to the 2010 Haiti earthquake. Walker died on November 30, 2013, at the age of 40 as a passenger in a single-car crash alongside friend and driver Roger Rodas. Walker was working on three films at the time of his death which were released posthumously: Hours (2013), Brick Mansions (2014), and Furious 7 (2015). 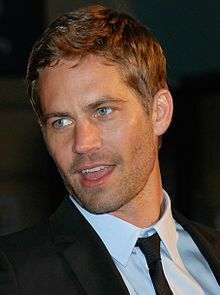 The Wiz Khalifa song "See You Again", featuring Charlie Puth, was commissioned for the Furious 7 soundtrack as a tribute to Walker. It was nominated for the Golden Globe for Best Original Song in 2015 and was the number-one song in the United States for 12 weeks. Walker was born in Glendale, California, and was the son of Cheryl (née Crabtree), a fashion model, and Paul William Walker III, a sewer contractor and boxer who was a two-time Golden Gloves champion. Paul's paternal grandfather had a boxing career as "'Irish' Billy Walker". Paul's ancestry was mostly English, with some German, Swiss, and Irish. One of his grandfathers raced factory cars for Ford in the 1960s. The oldest of five siblings, Walker was raised primarily in the Sunland community of Los Angeles and attended high school in the San Fernando Valley, graduating from Sun Valley's Village Christian School in 1991. He was raised as a member of The Church of Jesus Christ of Latter-day Saints. After high school, Walker attended several community colleges in Southern California, majoring in marine biology. Walker began his small screen career as a toddler, when he starred in a television commercial for Pampers. He began modeling at the age of two and began working on television shows in 1985, with roles in shows such as Highway to Heaven, Who's the Boss?, The Young and the Restless, and Touched by an Angel. That year he starred in a commercial for Showbiz Pizza. Walker's film career began in 1986, with the horror/comedy film Monster in the Closet. In 1987 he appeared in The Retaliator (aka Programmed to Kill), a low budget cyborg action film, with Robert Ginty. He and his sister Ashlie were contestants on a 1988 episode of the game show I'm Telling! ; they finished in second place. In 1993 he played Brandon Collins on the CBS soap opera The Young and the Restless. He and his co-star Heather Tom, who played Victoria Newman, were nominated for Outstanding Lead Actor and Actress in a soap opera at the Youth in Film Awards. In 1998, Walker made his feature film debut in the comedy Meet the Deedles, which finally gained him fame. This subsequently led to supporting roles in the movies Pleasantville (1998), Varsity Blues (1999), She's All That (1999), and The Skulls (2000). Walker drove a Nissan Skyline GT-R in 2 Fast 2 Furious. In 2001, Walker's breakthrough role arrived when he starred opposite actor Vin Diesel in the successful action film The Fast and the Furious, the first film in the franchise. The film established Walker as a notable film star and leading man and led to his reprise of the role in the 2003 sequel 2 Fast 2 Furious. He continued his career with leading roles in films such as Joy Ride (2001), Timeline (2003), and Into the Blue (2005). He had a supporting role in Clint Eastwood's adaptation of Flags of Our Fathers (2006). Walker then starred in the crime thriller Running Scared and Walt Disney Pictures' Eight Below, both released in 2006. Eight Below garnered critical-acclaim and opened in first place at the box office, grossing over US$20 million during its first weekend. During the filming of Running Scared, director Wayne Kramer stated that "[Walker] is that guy on some level" when comparing Walker with his character in the movie, Joey Gazelle. Kramer continued on to say that he "loved working with [Walker] because as a director he's completely supportive of my vision of what the film is. And even better, he's completely game for it." Walker starred in the independent film The Lazarus Project, which was released on DVD on October 21, 2008. He subsequently returned to The Fast and the Furious franchise, reprising his role in Fast & Furious, which was released on April 3, 2009. Walker then appeared in the crime drama Takers, which began filming in September 2008 and was released in August 2010. The Coty Prestige fragrance brand Davidoff Cool Water for Men announced in January 2011 that Walker was going to be the new face of the brand as of July 2011. He reprised his role in the fifth installment of The Fast and the Furious series, Fast Five (2011), and again in Fast & Furious 6 (2013). For this film, he won the 2014 MTV Movie Award as best on-screen duo, with Vin Diesel. He was part of an ensemble cast in Wayne Kramer's Pawn Shop Chronicles (2013), which was Walker's last film released before his death. Shortly after his death, the Hurricane Katrina based film Hours, which he had completed earlier in 2013, was released on December 13, 2013. He had also completed the action film Brick Mansions, a remake of the French film District 13, which was released in April 2014. At the time of his death, Walker had been filming Furious 7, which was slated for release in July 2014. The film was completed by using his brothers Caleb and Cody as his body doubles/stand-ins, and CGI, and was released in April 2015. Walker was also set to play Agent 47 in the video game adaptation Hitman: Agent 47, but died before production began. From left: Dwayne Johnson, Ludacris, Jordana Brewster, Vin Diesel, and Walker with Natalie Morales for NBC's Today Show. Walker shared close friendships with his Fast & Furious cast mates. Walker lived in Santa Barbara with his dogs. He and Rebecca McBrain, a one-time girlfriend, had a daughter named Meadow Rain Walker, who lived with her mother in Hawaii for 13 years and then moved to California to live with Walker in 2011. Her godfather is Vin Diesel. At the time of his death, Walker was dating Jasmine Pilchard-Gosnell. They had been dating since she was 16 and he was 33. Walker was raised in a Mormon household, but later became a non-denominational Christian. He held a brown belt in Brazilian jiu-jitsu under Ricardo "Franjinha" Miller at Paragon Jiu-Jitsu and was awarded his black belt by Miller posthumously. Walker held an interest in marine biology; he joined the board of directors of The Billfish Foundation in 2006. He fulfilled a lifelong dream by starring in a National Geographic Channel series Expedition Great White (later retitled Shark Men), which premiered in June 2010. He spent 11 days as part of the crew, catching and tagging seven great white sharks off the coast of Mexico. The expedition, led by Chris Fischer, founder and CEO of Fischer Productions, along with Captain Brett McBride and Dr. Michael Domeier of the Marine Conservation Science Institute, took measurements, gathered DNA samples, and fastened real-time satellite tags to the great white sharks. This allowed Dr. Domeier to study migratory patterns, especially those associated with mating and birthing, over a five-year period. In March 2010, Walker went to Constitución, Chile, to offer his help and support to the people injured in the 8.8 magnitude earthquake that struck on February 27. He flew with his humanitarian aid team, Reach Out Worldwide, to Haiti to lend a helping hand to the 2010 Haiti earthquake victims. 1965 Shelby Ford Mustang GT350SR continuation car. Roger Rodas became Walker's financial adviser in 2007 and helped to establish Reach Out Worldwide. Rodas, a pro-am racer was the CEO of Always Evolving, a Valencia high-end vehicle performance shop owned by Walker. Walker was also a close friend of his 2 Fast 2 Furious co-star Tyrese Gibson. Vin Diesel considered Walker to be like a brother, both on and off screen, and affectionately called him "Pablo". Walker's mother referred to her son as Diesel's "other half". On November 30, 2013, at about 3:30 p.m. PST, Walker and Roger Rodas, 38, left an event for Walker's charity Reach Out Worldwide for victims of Typhoon Haiyan (Yolanda), with Rodas driving his Porsche Carrera GT. In a 45 mph (72 km/h) speed zone on Hercules Street near Kelly Johnson Parkway in Valencia, Santa Clarita, California, the car crashed into a concrete lamp post and two trees and burst into flames. Rodas died of multiple trauma while Walker died from the combined effects of trauma and burns. Both of their bodies were burned beyond recognition. The curve where Walker and Rodas were killed is a popular spot for drifting cars. No alcohol or other drugs were found in either man's system, and neither mechanical failure nor road conditions appeared to play a role. Police found no evidence of drag racing. The investigation concluded that the car's speed – between 80 mph (130 km/h) and 93 mph (150 km/h) – and age of the tires were the primary reasons for the crash. With Furious 7 in the middle of filming at the time of Walker's death, Universal announced an indeterminate hiatus on the production, citing a desire to speak with his family before determining what to do with the film. Numerous friends and movie stars posted tributes to Walker on social media. His body was cremated and his ashes were buried in a non-denominational ceremony at Forest Lawn Memorial Park. His life was later chronicled in the documentary I Am Paul Walker, which was released on August 11, 2018. In December 2014, Walker's father, Paul III, filed a wrongful death claim against Rodas's estate seeking the return of, or "a proportionate share" of revenue generated by a group of automobiles that were jointly owned by both Walker and Rodas. In September 2015, Walker's daughter Meadow filed a wrongful death lawsuit against Porsche for the death of her father, claiming that the Porsche Carrera GT had numerous design defects including a history of instability, and that its seat belt placement can cause harm upon impact. Porsche's response denied any wrongdoing and blamed Walker himself, stating: "The perils, risk, and danger were open and obvious and known to him, and he chose to conduct himself in a manner so as to expose himself to such perils, dangers, and risks, thus assuming all the risks involved in using the vehicle." In April 2016, U.S. District Court Judge Philip S. Gutierrez ruled in favor of Porsche in a separate lawsuit filed by Roger Rodas' widow, Kristine. The ruling had no bearing on two other cases against Porsche which have been filed by Walker's father, who is also the executor of the actor's estate, and his daughter. Walker's father and daughter both reached an agreement with Porsche. 1 2 "Paul Walker Leaves Entire $25 Million Estate to Daughter". People. February 4, 2014. Retrieved March 8, 2017. 1 2 Weisman, Aly. "Paul Walker Left His Entire $25 Million Estate To His 15-Year-Old Daughter — But Things Could Get Messy", Business Insider, published April 2, 2014. Retrieved May 11, 2015. ↑ WGN News at Nine. Chicago, IL. November 30, 2013. Event occurs at 21:32 CST (32 minutes). WGN-TV/WGN America. ↑ "Paul Walker – Biography". The New York Times. Retrieved March 4, 2014. ↑ Eggenberger, Nicole (December 2, 2013). "Paul Walker Said Daughter Meadow Encouraged Him to Keep Acting". Us Weekly. Retrieved October 10, 2017. ↑ Gicas, Peter (December 2, 2013). "Paul Walker's Cologne Ad Airs During UK Soccer Game, Sparks Outrage". E! Online. Retrieved October 10, 2017. ↑ Suebsaeng, Asawin (April 2, 2015). "Paul Walker's True Passion: Whatever Happened to Walker's Disaster-Relief Rescue Squad?". The Daily Beast. Retrieved October 10, 2017. ↑ Merry, Stephanie; Yahr, Emily (December 10, 2015). "Golden Globes nominations 2016: Complete list". The Washington Post. Retrieved December 10, 2015. 1 2 Hobson, Louis B. (June 17, 2001). "Paul Walker kicks it into high gear". Canoe.ca. Retrieved December 5, 2013. 1 2 3 Keck, William (September 27, 2005). "Fame lets Paul Walker dive in". USA Today. Retrieved December 3, 2013. ↑ Atkin, Hillary (June 6, 2003). "Walker's in the 'Fast' lane to film stardom". USA Today. Retrieved December 3, 2013. "Paul William Walker II". Retrieved December 22, 2013. "Paul William Walker II 1930 United States Census". FamilySearch. Retrieved December 22, 2013. "Meet Paul Walker". Spartanburg Herald-Journal. March 29, 2006. Retrieved December 3, 2013. ↑ "Stars React To Paul Walker's Death, Other Crash Victim Identified". CBS Los Angeles. December 1, 2013. Retrieved December 3, 2013. ↑ Gazzar, Brenda (December 1, 2013). "'Fast & Furious' star Paul Walker remembered as kind, carefree". Los Angeles Daily News. Retrieved December 3, 2013. ↑ "Paul Walker Bio: Fast & Furious Actor". Tribute. Tribute Entertainment Media Group. Retrieved December 3, 2013. ↑ Youtube. "Showbiz Pizza Commercial". Retrieved July 3, 2012. ↑ "Eight Below (2006)". Box Office Mojo. Retrieved September 28, 2008. 1 2 Murray, Rebecca. "Interview with 'Running Scared' writer/director Wayne Kramer". About.com. Retrieved September 28, 2008. ↑ "Apple – Movie Trailers – Fast and Furious". Apple. Retrieved September 28, 2008. ↑ Fleming, Michael (September 9, 2008). "Screen Gems digs up 'Bone' cast". Variety. Retrieved December 3, 2013. ↑ "Coty Prestige Announces Agreement with Paul Walker". PR Newswire. January 14, 2011. Retrieved December 3, 2013. "Report: Paul Walkers death forces delay of Fast and Furious 7 shoot". HitFix. December 1, 2013. Retrieved December 3, 2013. The Deadline Team. "Paul Walker's Brothers Jumping in to Help Finish 'Fast & Furious 7′ Action Scenes – Deadline". Deadline. ↑ Trumbore, Dave. "Paul Walker Leads HITMAN Reboot in AGENT 47". Collider. Retrieved December 3, 2013. ↑ Koltnow, Barry (February 18, 2006). "Just chillin'". The Orange County Register. Retrieved December 3, 2013. ↑ Gilbey, Ryan (December 1, 2013). "Paul Walker obituary". The Guardian. UK. Retrieved December 5, 2013. ↑ Smith, Grady (December 1, 2013). "The sides of Paul Walker you may have missed". Entertainment Weekly. Archived from the original on December 1, 2013. Retrieved December 1, 2013. ↑ Tate, Amethyst (December 2, 2013). "Who Is Jasmine Pilchard-Gosnell? Paul Walker's 23-Year-Old Girlfriend Mourns Actor With Family After Fatal Car Crash". International Business Times. ↑ "Meadow Walker, Paul's daughter inspired him to continue acting; Fast and Furious star on being Christian". Christian Today. December 2, 2013. Retrieved August 5, 2016. ↑ Duane, Daniel (September 6, 2005). "Paul Walker's Adventure Sports Workout Routine". Men's Health. Retrieved December 3, 2013. ↑ "Paul Walker receives BJJ Black Belt at Memorial". Bjpenn.com. December 9, 2013. Archived from the original on December 12, 2013. Retrieved December 10, 2013. ↑ Arnold, Catherine (September 25, 2006). "Paul Walker and Marine Biology: Foundation Presents Marine Awards". Nature World News. Retrieved March 8, 2013. ↑ "Paul Walker Leads Shark Expedition". Starpulse.com. November 12, 2009. Archived from the original on April 26, 2010. Retrieved November 15, 2009. ↑ "Actor Paul Walker Joins National Geographic Shark Expedition". DiverWire. November 13, 2009. Archived from the original on December 3, 2009. Retrieved November 15, 2009. ↑ "Expedition Great White". National Geographic. Archived from the original on November 16, 2012. Retrieved November 15, 2009. ↑ "REACH OUT Worldwide". REACH OUT Worldwide. ↑ "AE Performance". Redline Time Attack. Archived from the original on March 22, 2010. ↑ "Paul Walker, estrella de "Rápidos y furiosos" falleció en accidente de tránsito". El Comercio. ↑ "Suit Over Paul Walker's Car Collection Settles". NBC Southern California. Retrieved August 6, 2018. ↑ "A Look Inside Paul Walker's Garage [Photos]". Motor1.com. Retrieved August 14, 2018. ↑ "Paul Walker - A True Car Enthusiast". BMW BLOG. April 6, 2015. Retrieved August 14, 2018. ↑ "Take a tour of Paul Walker's car collection". Autoblog. Retrieved August 6, 2018. ↑ "Walker and Rodas, you will be missed". Motor Sport. December 1, 2013. Retrieved December 2, 2013. ↑ "Call to Action". Merrill Lynch. Archived from the original on December 2, 2013. Retrieved November 30, 2013. ↑ "Rodas: Racer, manager, friend to Walker". December 3, 2013. Retrieved June 20, 2014. ↑ Smith, Perry (November 30, 2013). "Paul Walker, Santa Clarita CEO Reportedly Killed in Fatal Single-Car Crash". KHTS Radio. Retrieved November 30, 2013. Tonks, Owen (January 4, 2014). "Paul Walker best friend Tyrese Gibson still struggling after actor's death". Daily Mirror. Retrieved January 31, 2014. "Tyrese Gibson Heartbroken Over Paul Walker's Death". ABC News. December 4, 2013. Retrieved December 10, 2013. ↑ "Vin Diesel Reacts to Paul Walker's Death: 'I Will Always Love You'". The Wrap. Retrieved August 12, 2014. ↑ "Paul Walker death: Vin Diesel's touching Facebook post about how he lost his 'other half'". The Mirror. 1 2 Duke, Alan; Sutton, Joe (November 30, 2013). "'Fast & Furious' star Paul Walker killed in car crash". CNN. Retrieved November 30, 2013. 1 2 "Autopsy blames impact and fire for actor Paul Walker's death". CNN. December 4, 2013. Retrieved December 18, 2013. "Officials: Paul Walker crash not part of street race". The Press Democrat. Santa Rosa CA. December 3, 2013. Retrieved December 7, 2013. "Publicist: Fast & Furious Actor Paul Walker Dies in Car Crash". Time. New York. November 30, 2013. Archived from the original on December 9, 2013. Retrieved November 30, 2013. Schabner, Dean (November 30, 2013). 'Fast and Furious' Star Paul Walker Killed in Crash". ABC News. Landau, Joel (November 30, 2013). "Paul Walker dead at 40: 'Fast and Furious' star killed in fiery car crash". Daily News. New York. Retrieved November 30, 2013. "Fast & Furious actor Paul Walker dies in California car crash". BBC News. December 1, 2013. Retrieved December 1, 2013. ↑ Wood, Daniel B. (December 4, 2013). "Paul Walker crash could 'romanticize' growing street racing culture". The Christian Science Monitor. Retrieved December 7, 2013. ↑ "Speed may have been factor in Fast and Furious star Paul Walker's crash". Sunday Morning Herald. January 4, 2014. Retrieved January 4, 2014. ↑ ""Fast & Furious"-Star : Walker-Auto war fast 100 Stundenkilometer zu schnell". Die Welt (in German). January 4, 2014. Retrieved January 4, 2014. ↑ "Paul Walker death investigation: Police rule out second vehicle, focus on speed". CNN. Retrieved December 2, 2013. ↑ Duke, Alan (March 26, 2014). "Investigators: Speed – not drugs, racing or mechanical failure – killed Paul Walker". CNN. Retrieved March 26, 2014. ↑ Gonzalez, Maricela. "'Fast & Furious 7' production halted after Paul Walker's death". Entertainment Weekly. Retrieved December 5, 2013. ↑ "'Speechless' Vin Diesel pays tribute to Paul Walker". The New Zealand Herald. Auckland. December 2, 2013. Retrieved December 2, 2013. ↑ "Paul Walker has been Buried at The Forest Lawn Memorial Park Cemetery in the Hollywood Hills Today". Allvoices.com. December 4, 2013. Archived from the original on January 14, 2014. Retrieved December 18, 2013. ↑ Zuckerman, Esther. "Paul Walker's dad files claim against estate of driver in fatal car crash". Entertainment Weekly. Retrieved January 8, 2015. ↑ Bever, Lindsey (September 29, 2015). "Paul Walker's teen daughter sues Porsche over his death in fiery crash". The Washington Post. ISSN 0190-8286. Retrieved January 7, 2016. ↑ "Porsche Blames Paul Walker For His Own Death". www.yahoo.com. Retrieved November 17, 2015. 1 2 Child, Ben (April 6, 2016). "Judge rules Porsche not to blame for Paul Walker's death". The Guardian. Retrieved April 6, 2016. ↑ D'Zurilla, Christie (October 25, 2017). "Paul Walker's daughter settles with Porsche in wrongful-death suit". Los Angeles Times. Retrieved June 6, 2018. Wikimedia Commons has media related to Paul Walker.